Give yourself a bit of retail therapy at Ginza and Minato Mirai 21. Satisfy your inner culture vulture at Odaiba and Asakusa. The adventure continues: contemplate in the serene atmosphere at Senso-ji Temple, admire the striking features of Tokyo Tower, take a stroll through Harajuku Takeshita-dori, and don't miss a visit to Meiji Jingu Shrine. To see reviews, more things to do, where to stay, and tourist information, read Tokyo attractions planner. Tel Aviv, Israel to Tokyo is an approximately 16.5-hour flight. You can also do a combination of flight and train. Due to the time zone difference, you'll lose 7 hours traveling from Tel Aviv to Tokyo. Traveling from Tel Aviv in March, things will get slightly colder in Tokyo: highs are around 17°C and lows about 7°C. Finish your sightseeing early on the 6th (Wed) to allow enough time to travel to Kyoto. Get some cultural insight at Dotonbori and Nijo Castle. Explore hidden gems such as Tofuku-ji Temple and Toji. Explore the numerous day-trip ideas around Kyoto: Nara (Kofuku-ji Temple & Nara Park). There's still lots to do: contemplate the long history of Kiyomizu-dera Temple, wander the streets of Gion, and contemplate in the serene atmosphere at Kinkaku-ji. For traveler tips, other places to visit, reviews, and other tourist information, use the Kyoto trip itinerary planning website . You can take a train from Tokyo to Kyoto in 3 hours. Alternatively, you can fly; or drive. In March in Kyoto, expect temperatures between 16°C during the day and 5°C at night. Wrap up your sightseeing on the 9th (Sat) to allow time to travel to Ishigaki. Kick off your visit on the 10th (Sun): look for gifts at Pinion Direct Shop, then see the vivid underwater world at Kabira Ishizaki Manta Scramble, and then enjoy the sand and surf at Kondoi Beach. On the 11th (Mon), you'll have a packed day of sightseeing: tour the pleasant surroundings at Yonehara Beach, visit a coastal fixture at Cape Hirakubozaki, and then take in panoramic vistas at Tamatorizaki Observatory. To find out how to plan a trip to Ishigaki, use our trip itinerary maker. You can do a combination of train and flight from Kyoto to Ishigaki in 6 hours. Another option is to fly. When traveling from Kyoto in March, plan for a bit warmer days in Ishigaki, with highs around 26°C, while nights are much hotter with lows around 21°C. 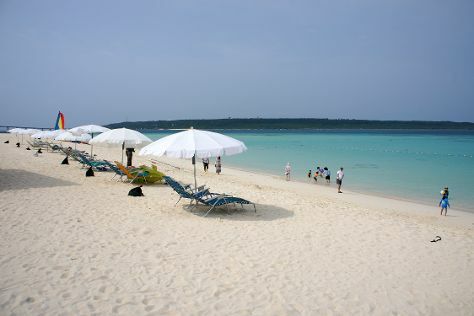 Finish your sightseeing early on the 11th (Mon) to allow enough time to travel to Miyakojima. Start off your visit on the 12th (Tue): tour the pleasant surroundings at Sunayama Beach, snap pictures at Irabu Bridge, then snap pictures at Kurima Bridge, and finally kick back and relax at Yonaha Maehama Beach. Get ready for a full day of sightseeing on the next day: explore the gorgeous colors at Yabiji, discover the deep blue sea with a scuba or snorkeling tour, and then don't miss a visit to Boraga Limestone Cave. To find maps, where to stay, other places to visit, and other tourist information, refer to the Miyakojima trip planner. You can fly from Ishigaki to Miyakojima in 2 hours. 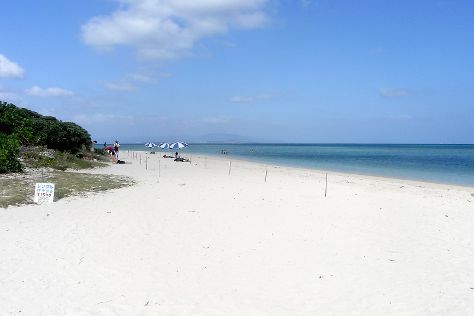 March in Miyakojima sees daily highs of 26°C and lows of 20°C at night. Finish your sightseeing early on the 13th (Wed) to allow enough time to travel to Naha. Head to Onna Station Nakayukui Market and AEONMALL OKINAWA RYCOMfor some retail therapy. Satisfy your inner culture vulture at Sefa-Utaki and Okinawa Prefectural Museum & Art Museum. Venture out of the city with trips to Katsuren Castle Ruins (in Uruma), Scuba & Snorkeling (in Onna-son) and Itoman (Okinawa Peace Memorial Park & Himeyuri Peace Museum). Next up on the itinerary: explore the historical opulence of Shurijo Castle, don't miss a visit to Former Japanese Navy Underground Headquarters, and pick up some local products at Keiben Station Kariyushi Market. For photos, more things to do, ratings, and tourist information, refer to the Naha trip planning tool . You can fly from Miyakojima to Naha in 2.5 hours. Expect a daytime high around 24°C in March, and nighttime lows around 19°C. On the 17th (Sun), wrap the sightseeing up by early afternoon so you can travel back home.